Twomey’s passionate speech directly called on the Taoiseach for action. Twomey was recognised at RTÉ's People of the Year awards. 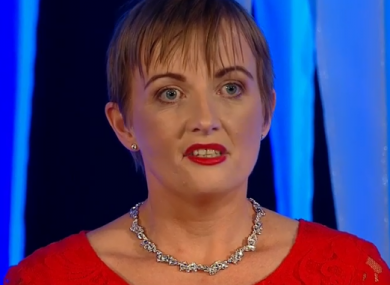 CAMPAIGNER VERA TWOMEY used her acceptance speech at last night’s RTÉ’s People of the Year awards to make a passionate call for the government to legislate for medical cannabis usage. Twomey rose to national prominence during a two-and a-half year campaign to secure medical cannabis to treat her daughter Ava’s rare form of epilepsy. The condition is potentially lethal, and has previously pushed Ava into cardiac arrest and into an eight-day coma. We were let down by the government but we were never let down by the Irish people. Ava, now eight years old, is one of only seven people in the country to have been granted a licence for medical cannabis. Twomey managed to obtain the licence after these years of campaigning, which included two 260-kilometre walks from Cork to the Dáil to capture the government’s attention to her case. Before receiving her licence last December, Ava went to the Netherlands for treatment with medical cannabis over the summer. Twomey said that Ava is now “doing wonderful” and experiences no seizures. Last night, she called on Taoiseach Leo Varadkar, who was at the event to present an award, to move through legislation that would legalise medical cannabis for more people in Ireland. We want it now, and you are the man to do it, and we want you to do it immediately. This treatment, Twomey said, gave Ava the freedom “to live, to grow and to be happy, with a brighter future”. “Everyone deserves that right now, and into the future – not just seven people who have been granted licences in Ireland to date, but the thousands of other people who are watching here tonight, hoping and praying that legislation will be brought through to ease their suffering and their pain. We need legislation to access treatment properly. We do not want pain, we want our rights. We do not want the pressure, we need our medication. Her speech left many in the audience crying and was met with a standing ovation. Twomwy was recognised alongside historian Catherine Corless, the crew of Rescue 116 and rugby referee Joy Neville. RTÉ has been criticised online for circulating a clip of the first half of Twomey’s speech, which does not include her critique of the government. Speaking on Cork’s RedFM today, Twomey told Neil Prendeville that it was “really sad” that her points were excluded. Comments on YouTube accuse the national broadcaster of censoring Twomey, and call for the full speech to be shown. If you are having trouble loading the video, watch here. A spokesperson for RTÉ denied that Twomey was censored. The clips shared on social media are “never the full interview”, but are instead used for “marketing purposes” or to direct people to the show or the RTÉ player, they told TheJournal.ie. The RTÉ player currently has an eight-minute, standalone broadcast of Twomey’s speech available. RTÉ’s Morning Ireland did not mention Twomey when recapping the awards this morning. RTÉ has not received any official complaints, the spokesperson said. Email “'We want our rights': Vera Twomey makes passionate call for legislation on medical cannabis”. Feedback on “'We want our rights': Vera Twomey makes passionate call for legislation on medical cannabis”.